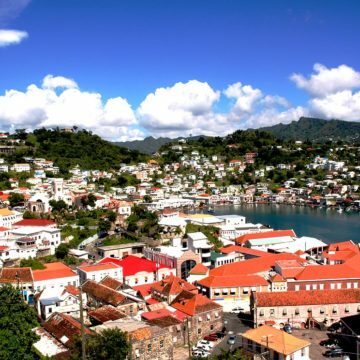 Grenada is called the “The Spice Island” and this small island is bathed in the soft fragrance of tropical spices. 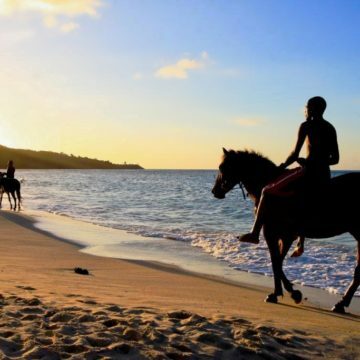 Small and perfectly formed, this classic Caribbean island has beautiful countryside, 45 superb beaches, shaded by swaying palm trees and is set in a glorious blue ocean. 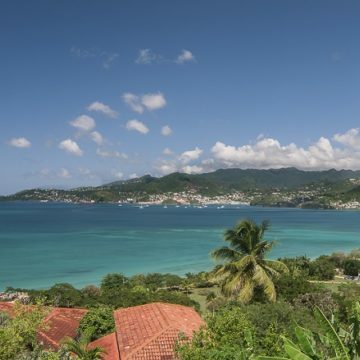 Grenada is a quiet, relaxed island – no mass tourism, no large resorts, no theme parks. Visitors can enjoy modern accommodation and facilities – but in that typically relaxed, Caribbean way – no fuss no rush – at your own pace. 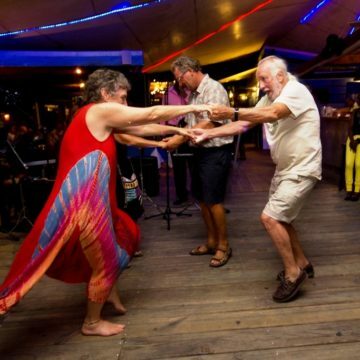 Grenada’s nightlife follows the same island characteristic – easy and relaxed – you can enjoy the nightlife to the full – as a welcome guest and not a tourist. There are lots of restaurants, bars and clubs with live music and dancing The local people are always ready to welcome you with a broad smile. Being able to completely relax makes this a real holiday! 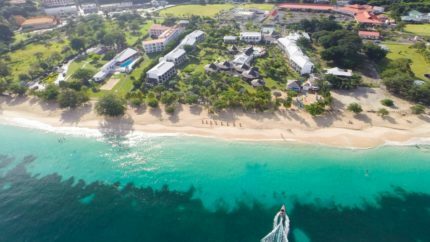 Pure Grenada is a breath of fresh air – an exciting holiday experience. As a tropical island, the weather does not vary a great deal – so any time of year is a good time to go. Warm and sunny, with a cooling breeze that keeps you fresh and comfortable – all year round. Whatever kind of holiday you prefer, you can do it in comfort and enjoy it to the full. The “Pure Grenada” motto reflects the importance the island places on its natural world. 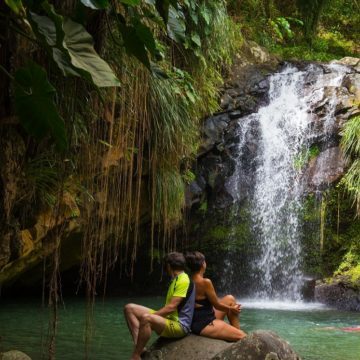 Grenada’s dramatic countryside is covered by a dense rainforest with beautiful waterfalls, mountain lakes and hot springs and some the most colourful plants and flowers on our planet. 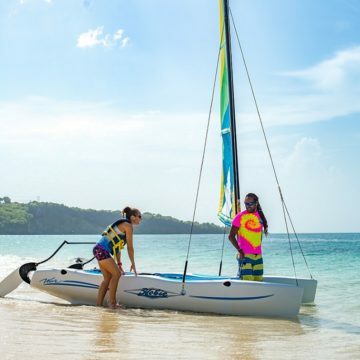 Relax on the beaches and enjoy water sports. 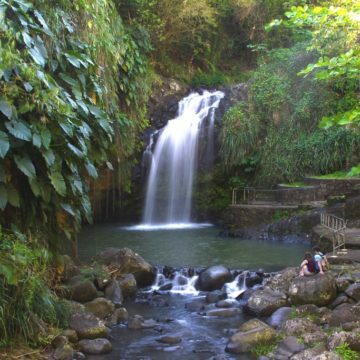 Explore the dense rainforest covering the extinct volcano at the heart of the island. Visit the historic forts, lakes, waterfalls, spice estates etc. Experience the spectacular diving and snorkelling. There is so much to enjoy on “Pure Grenada”. Grenada’s natural beauty continues below the waterline, as exciting underwater as it is on land. Divers and snorkellers will see coral formations, pinnacles and caves and several interesting wrecks. 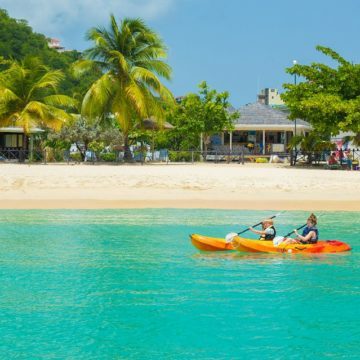 The west coast faces the Caribbean Sea, wonderfully warm, clear water, perfect conditions for water sports: sailing, windsurfing, wake-boarding, kite-surfing, kayaking and superb diving and snorkelling. The Caribbean Sea is known for its rich variety and abundance of marine life. The Atlantic coast is visited by large ocean-roaming creatures. The clear water gives snorkellers views of the undersea world they would not normally see. We are an ATOL licensed Caribbean holiday specialist with a wealth of local knowledge and years of experience on Grenada. For many people our islands are “undiscovered” places – exciting new holiday destinations. Having enjoyed and experienced much of what Grenada has to offer, we know the island well. We can answer your questions from personal experience and tailor-make a holiday to your requirements and wishes. We enjoy talking about the island and would be delighted to discuss any plans you have for a holiday in this special part of the world. With our help, you can enjoy places of interest and things to do, at your own pace. 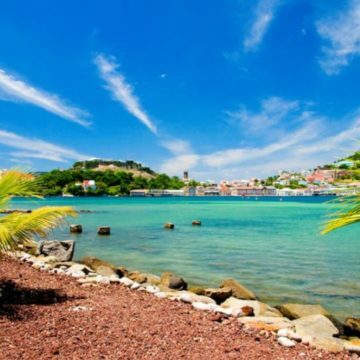 Grenada is the archetypal Caribbean island, golden beaches, tall palm trees, bright blue ocean and a magnificent green rain forest covering the mountainous countryside. A huge diversity of natural features and choice of things to do, on a small beautiful island. Grenada protects the island culture and natural environment and, due to the island’s resistance to over development, it is quiet and relaxed. There is no mass tourism, no fun fairs or theme parks and no hotel can exceed the height of the palm trees. There are no “tourist areas” on Grenada. 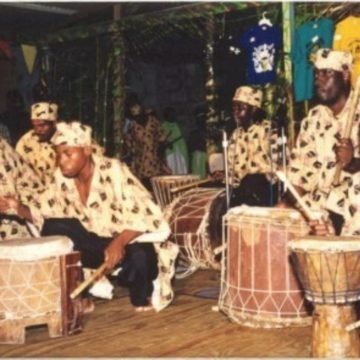 The island culture is an interesting fusion of old traditions – from Africa, France, England and Caribbean culture. Grenada’s diverse cultural heritage has developed a friendly, welcoming attitude towards visitors. 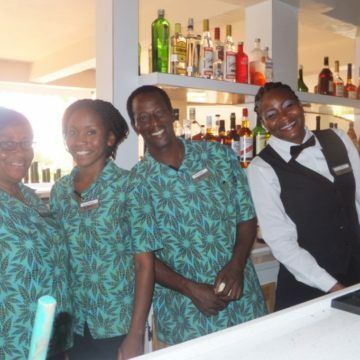 We were pleasantly surprised at the friendliness of the local people – who regularly welcome you to their island with the inevitable Grenadian smile! This friendly atmosphere allows you to relax, enjoy the beaches, activities, wonderful food and the lively nightlife. Making it a proper holiday – a refreshing experience. Grenada is in the south eastern Caribbean 100 miles north of South America, 85 miles south of St. Vincent, 171 miles south west of Barbados. The nation of Grenada is made up of three islands – Grenada, Carriacou and Petite Martinique – home to around 100,000 people. Grenada is the largest island, but still only 21 by 12 miles. 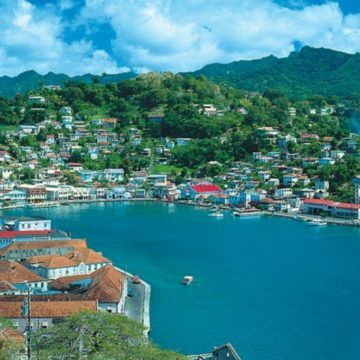 The capital, St. Georges, is considered to be the prettiest city in the Caribbean. Its horseshoe shaped harbour is surrounded by pastel coloured warehouses and brightly painted shops and homes. Christopher Columbus arrived on Grenada in 1498 which was already inhabited by the Carib Indians, who had migrated from South America displacing the peaceful Arawaks. The Amerindians called their island Camerhogue, but Columbus renamed it Concepcion. However, Spanish sailors thought it reminded them of Andalusia and called it Granada. Although control of the island passed from France to Britain over the years, the name stuck with a slight change from “Granada” to “Grenada”. The island was a major source of sugar and indigo (hence the name of the area called “True Blue”). The British Admiral George Rodney captured Grenada in 1762 and the island gained independence in 1974. The island remains an English speaking Commonwealth country. Wonderful weather! The air temperatures are almost always 30ºC (87ºF), there is very little seasonal variation, cooled by a steady breeze from the Atlantic, which keeps you comfortable and fresh. Whatever you choose to do you can do it in comfort. The dry season is between January and May – rainy season is June to December. The rain falls in showers, rarely for more than an hour at a time. Tropical rain is heavy – but clears very quickly – and it’s warm and sunny again. 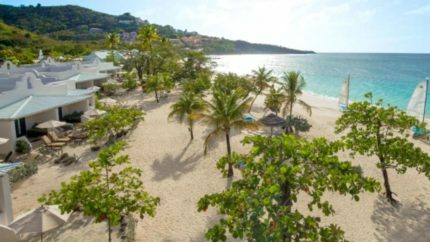 Grenada has a stunning coastline with 45 wonderful beaches and is surrounded by a bright blue ocean. 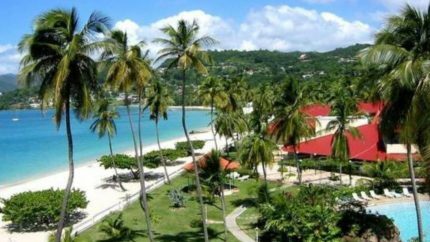 Grand Anse Beach is, “officially” of the best beaches in the world, a smooth expanse of soft sand stretching for two miles around a bay. Some beaches are great for water sports, diving and snorkelling. Other beaches are secluded and very quiet – like the superb Morne Rouge beach (my favourite). 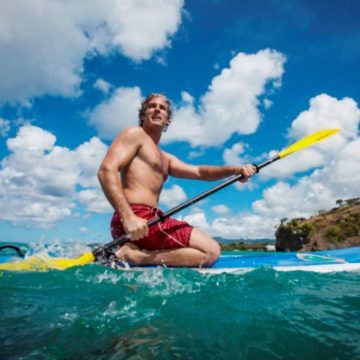 Away from the beaches there is a wide choice of sports and adventure activities to enjoy. The island is great for families or groups. Lots of fun activities to keep everyone happy. 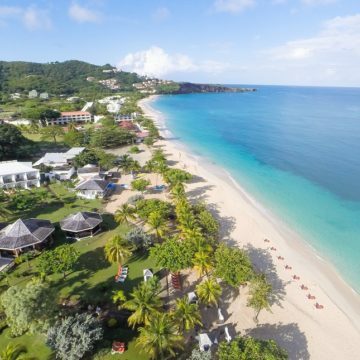 Grenada’s sheltered west coast faces the Caribbean Sea, known for its warm, clear water, ideal for swimming, snorkelling or diving. The calm water and steady breeze make ideal conditions for lots of water sports. The ocean around Grenada is ideal for snorkellers and divers who will get a fabulous view of the underwater world. Grenada is famous for its outstanding coral reefs – like the 5 mile long Boss Reef – its rich marine life and 15 fantastic shipwrecks – including the largest in the Caribbean, the Bianca C – and the unique Underwater Sculpture Park. Lots of exciting sites for snorkellers novices and experienced divers. 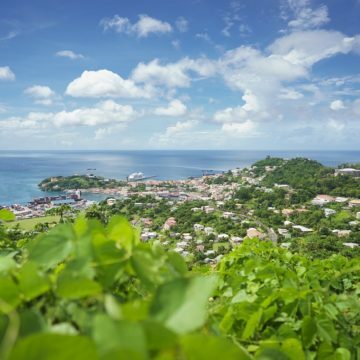 Grenada is known as “The Isle of Spice” – there are more spices here per square mile than any other place in the world. The rich fragrance of spices pervades the entire island. Grenada was formed by a volcano, now extinct, and its mountainous interior is covered by a dense rainforest. 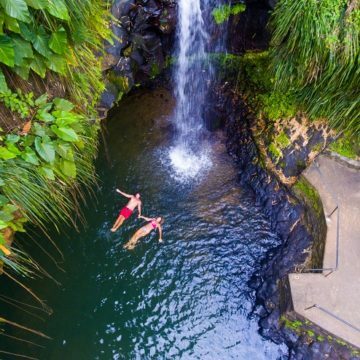 This breathtaking scenery is the most varied in the Caribbean, cascading rivers, majestic waterfalls, mountain lakes, hot springs and some the most colourful plants and flowers on our planet. Grenada has numerous nature parks, on land and sea, where strict measures protect the flora and fauna on the island and in the ocean. A series of trails allow visitors to get into the very heart of the rain forest and the nature parks to enjoy the island’s flora and fauna. 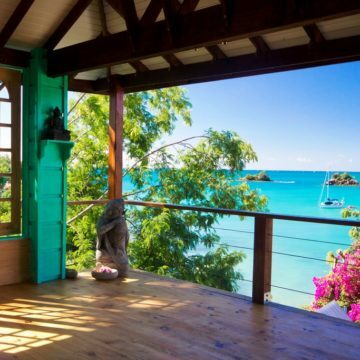 We are regular visitors to Grenada and have personally selected the accommodation offered on our site, which is predominantly in the south west, close to Grande Anse beach and the dive sites. 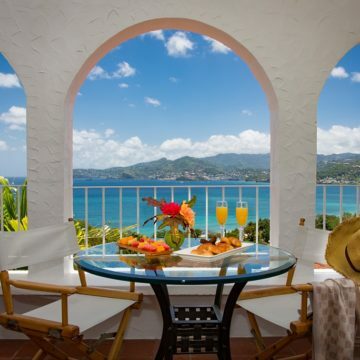 We offer a wide choice of excellent accommodation on Grenada, hotels, suites, apartments, cottages and studio apartments. Our holidays are designed for “independently minded” people and we prefer to offer smaller hotels with character and personal service. There is a choice of board options at hotels and resorts, while apartments and studios give you the freedom to self-cater, if you wish. Most of our accommodation will have restaurants nearby should self-catering lose its appeal. A lot of our accommodation is on small resorts which have amenities like swimming pools, dive centres and a restaurant (or two) on site. These are small resorts, nothing like the large European holiday resorts. We are the preferred tour operator for many resorts and have the best air fares, prices and offers. We offer a wide choice of services for you to get the very best from your holiday. On small islands, services like accommodation, vehicle hire, excursions, diving etc, get booked very quickly. To avoid disappointment these should be booked in advance. Booking services with us, will save you money and they will be part of an ATOL protected holiday. 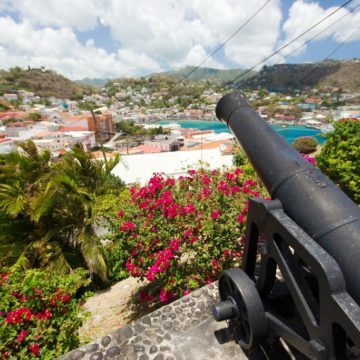 Grenada, like most islands in the Caribbean, was formed after a volcanic eruption. The volcano, now long extinct has been covered by a dense tropical rain forest. Grenada has a mountainous terrain, with several peaks, the highest being Mount St. Catherine at 840 metres (2,750 feet). The island’s unusual geography is the most varied in the Caribbean. Crater lakes, dwarf forests, mountain rainforests, dry forests and lowlands that lead to mangroves on the coast and into the ocean with its fantastic coral reefs. Mangroves, lakes, mountains and valleys and a spectacular rain forest all on a tiny Caribbean gem. All these natural habitats, interesting in themselves, are home to a diverse and thriving natural world. The mountainside has several small rivers with beautiful waterfalls and mountain crater lakes and hot springs. Visitors can use the many nature trails to enjoy the natural word and stunning scenery. 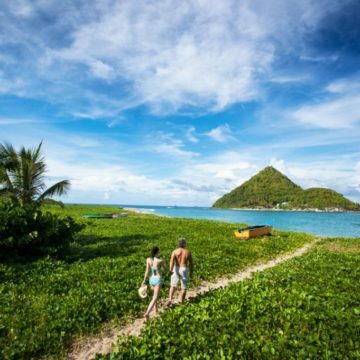 The islands of Grenada, Carriacou and Petite Martinique are generally undeveloped and most of the land and ocean remain in their glorious natural state, a haven for wildlife. There is no mass tourism on Grenada, and you won’t find any crowds in the places of special interest or the countryside generally. Take your time and enjoy the unspoilt natural surroundings in a relaxed and peaceful atmosphere. There are lots of guided tours, walking, minibus etc, but it is easy, and safe, to get out and about. Grenada has made great efforts to protect the natural environment on the island and in the ocean. Protected areas – nature parks – have been established where there are strict measures in place to protect the flora and fauna on the island, with remarkable success. I was surprised to see the emphasis, everywhere I went, on conserving and protecting the environment. 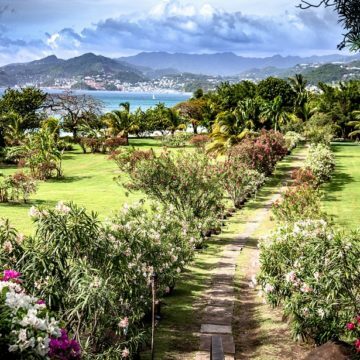 Grenada is also, justifiably, proud of its formal gardens. 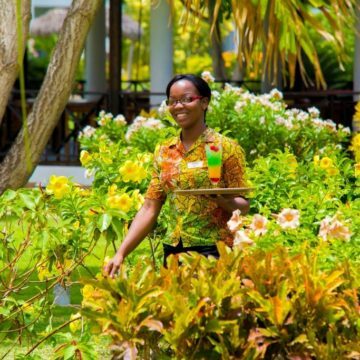 Grenada often wins awards at the Chelsea Flower Show. 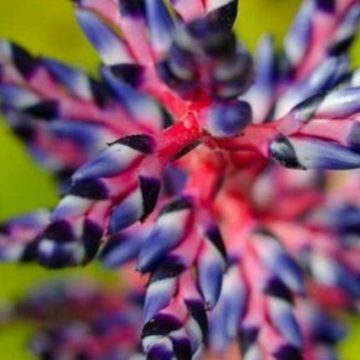 You’ll see many domestic gardens – cultivated by proud owners – full of exciting, colourful tropical flowers like heliconias and bougainvillea. Grand Etang Nature Reserve is the most interesting area on the island for nature lovers. Mt. Qua Qua and Mt. St. Catherine, at 840m (2756 feet) the highest point on Grenada, are both within the park. 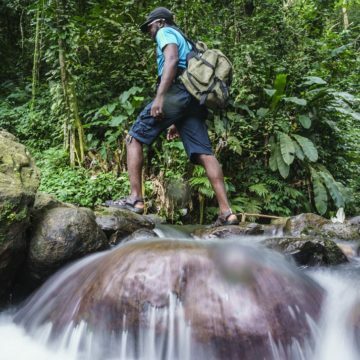 This park is a microcosm of Grenada’s natural world. A dense rain forest surrounding a breathtaking lake in the crater of the extinct volcano. 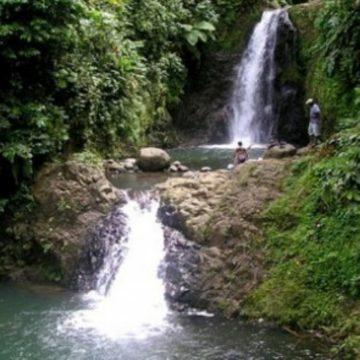 Within the lush tropical forest there are several spectacular waterfalls, hot springs and plantations on the hills. A series of well marked trail allow visitors to get into the very heart of the rain forest and enjoy seeing the island’s flora and fauna. The trails pass by the waterfalls, you can take a dip but be careful of slippery rocks (I wasn’t !). Hikes around the park range from an easy 15 minute stroll to 6 hour excursions. This is the most popular area in Grenada for hiking and trekking, and the scenery is breathtaking. The broad-winged hawk (known here as the gree-gree), Lesser Antillean swift, Antillean euphonia, purple-throated carib, Antillean crested hummingbird (known as the little doctor bird), and the Lesser Antillean tanager (known as the soursop) are all common sights. In addition, the Grand Etang is populated by plenty of frogs and lizards, as well as playing host to opossums, armadillos, mongooses, and the distinctive Grenada Mona monkey. Originally from Africa, brought in by traders a few hundred years ago. This 450-acre park is a scenic, coastal area, with a beautiful beach. Its lagoon is one of the most important wildlife habitats on the island. The lagoon is a protected bird sanctuary, home to a large number and great diversity of birds, including herons, black-necked stilts, common snipes, and other waterfowl. Levera’s lagoon is surrounded by a large mangrove forest – habitats vital to the environment of the whole planet. Levera’s marine areas have excellent coral reefs and sea grass beds that shelter lobsters, turtles and other marine inhabitants. The beaches are a hatchery for sea turtles, strictly protected during the laying season. Leatherbacks come ashore April to June – other species up to September. There is an excellent trail around the lagoon. This mangrove estuary along the south-west coast is one of the best bird-watching sights on Grenada. 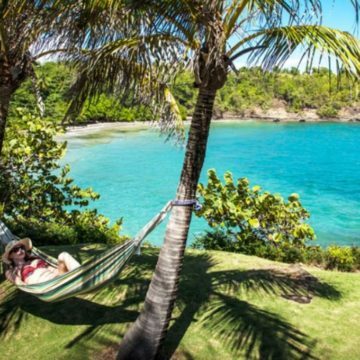 In addition to the mangrove, La Sagesse includes three excellent beaches, edged with palm trees, a superb coral reef for snorkelling, a pristine example of dry thorn scrub and cactus woodland and a salt pond. The salt pond attracts an abundance of different species. The scrubland is home to many lizards and iguanas. 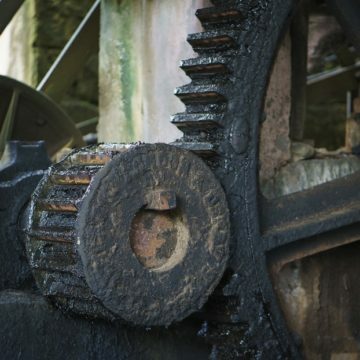 In the coastal woodland you will find the remains of sugar milling and rum distilleries. 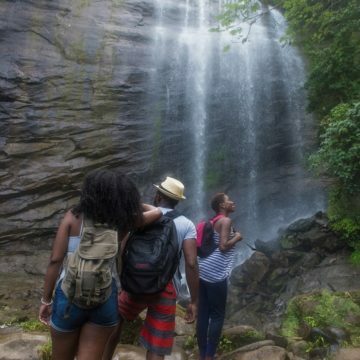 There are hiking trails where nature lovers can experience several types of eco-habitats in a small area. La Sagesse beach has facilities for visitors – a nice day out. Nearly all the bays on the eastern/Atlantic side of the island are mangrove habitats. Prime nesting areas for many birds and spawning grounds for fish, these areas, vital to the planet’s eco system, are now protected by the Ministry of Forestry and Fisheries. Excellent for bird watchers and snorkelers, the variety of marine life in and around the mangroves is stunning. There are 19 reptile species reported on Grenada, which include: red-footed tortoise, loggerhead turtles, green turtles, hawksbill turtles, leatherback turtles, house gecko, turnip-tailed gecko, bronze anole, Grenada tree anole, green iguana, common iguana, giant ameiva, laguaira bachia. Sadly all the turtle species are on the endangered list. but with protected areas there is hope these magnificent creatures will begin to thrive again. There are no venomous snakes on Grenada. There are a total of 168 species of bird recorded on Grenada, 3 are endemic, 1 has been introduced and 97 are rare or migratory. The species are too numerous to list here, but we have the list if want it – from the Antillean crested hummingbird to the endangered hook billed kite – found in the Levera National Park and nowhere else in the world. Grenada’s dramatic underwater rock and coral formations provide an extra dimension for marine life. The huge variety of habitats, in rich and varying ocean conditions, produces a staggering diversity of marine life. Colourful reef creatures to larger ocean-roaming creatures – turtles, rays, and sharks etc. 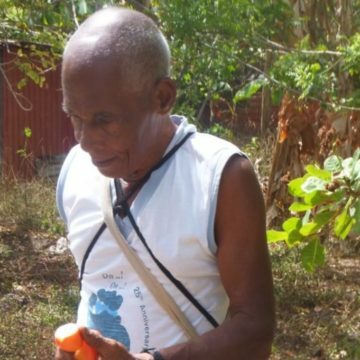 Douglas was fortunate enough to be shown around the island by the legendary Telfor Bedeau. 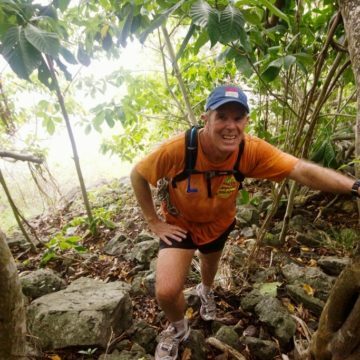 He has lived in the wilds of Grenada almost all his life – what this man doesn’t know about the wildlife of Grenada, isn’t worth knowing. Every few steps he stopped to show us something genuinely interesting. This is not a guided tour. This is a walk through the wilds of a tropical island, chatting with, and learning from, a knowledgeable and profoundly interesting man – a fascinating encyclopaedia of all things Grenadian. Grenada is in the eastern Caribbean Sea. St. Vincent and the Grenadines lie to the north – Trinidad and Tobago to the South. Grenada has no mass tourism and the island atmosphere is relaxed and laid back. Diving and snorkelling is easy and hassle free. Grenada was formed by a volcano, it still has an underwater volcano, and the dramatic underwater rock and coral formations provide a huge variety of habitats, in rich and varying ocean conditions, for a magnificent diversity of marine life. 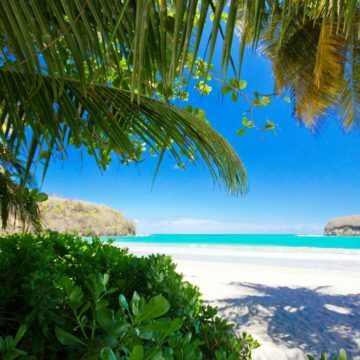 Grenada’s south and west coasts face the Caribbean Sea, the north and east coasts face the Atlantic Ocean. Currents from the open ocean enrich the ocean around this small island with nutrients which support a healthy marine life. From the very colourful reef creatures of the Caribbean Sea to the larger ocean roaming creatures of the Atlantic – turtles, rays, and sharks etc. 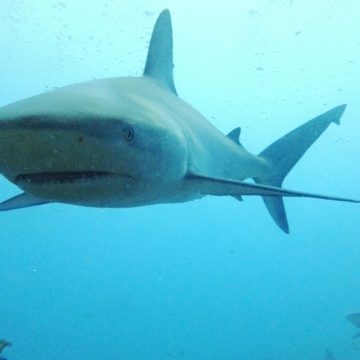 Grenada offers divers and snorkellers one of the best opportunities to encounter sharks in their natural habitat. Warm, clear water, quiet dive sites, pristine reefs, stunning wrecks, exhilarating drift dives, easy photographic dives and Grenada’s unique Underwater Sculpture Park. Grenada has something for everyone. 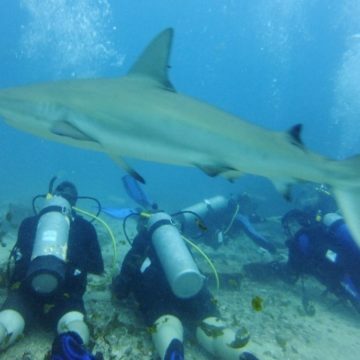 Whether you like wrecks, reefs, seahorses or sharks, the ocean surrounding Grenada and Carriacou has exciting experiences for divers and snorkellers of all levels. The Caribbean Sea means warm, clear water, ranging from 26ºC to 29ºC. Most divers will be fine in a 3 mm shortie. Visibility ranges from 25 to 45 metres. The weather and ocean conditions are comfortable and constant throughout the year. You can dive Grenada all year. On the west coast there is little or no current. On the north and east coasts there may be a little more current due to the open ocean. There is little seasonal change in the weather on a tropical Caribbean island, it’s almost always warm and sunny. The air temperature ranges from 27ºC to 33ºC and an ocean breeze keeps you cool and fresh. The rainy season is August to December, with short tropical downpours, then warm and sunny again. It’s rare to lose any diving to the weather. The underwater scenery in Grenada is every bit as beautiful and breathtaking as it is above the surface. Grenada has healthy, colourful coral reefs, walls and fantastic volcanic rock formations with caves, canyons, overhangs and huge pillars and pinnacles. Divers will see nearly every kind of coral, sea rods, elkhorn coral, large star coral boulders, brain coral, black coral, whip coral and more. Walls are encrusted with colourful sponges, large barrel sponges, gorgonians and sea fans. The reefs are close to shore, many in shallow water, with an amazing number and variety of colourful creatures. Look out for sea horses, including black ones. Some deeper reefs are favoured by pelagic species including huge schools of horse eye jacks, rainbow runner, hawksbill turtles, nurse sharks and spotted eagle rays. As always, there are no guarantees to what you will see underwater. But regulars around the islands include: brilliant Orange and Purple Fairy Basslets, Surgeonfish, Queen Triggerfish, Squid, Turtles, Stingrays, Barracuda, Lobsters, giant green Morays, Seahorses, Frogfish, Jacks, Barracuda, Spotted Eagle Rays, Nurse Sharks, Atlantic Spade Fish, large Groupers, Squirrelfish, Trunkfish, French Angel Fish, File Fish, vivid purple Creole Wrasse, yellow Chromis, French Grunts, Yellow Tail Snappers, yellow headed Jawfish, red band Parrotfish, Porcupine fish, black Margates, Pederson cleaner Shrimps and the “blue rain” – schools of Creole wrasse – and of course many more. .
From December and April Grenada’s waters are visited by various whale species, including Orca whales, Curvier beaked, humpback and sperm whales. Fifteen species have been recorded around the island. During the year pilot, Bryde’s, Sperm, Pygmy and Sei whales can be seen, as well as several varieties of dolphin. Leatherback and Hawksbill turtles have nesting grounds on the island and are a common sight in spring and summer. 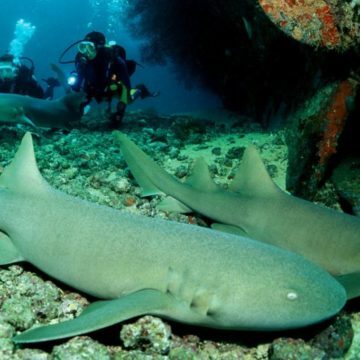 A large population of Nurse sharks lives around the Atlantic coast dive sites. 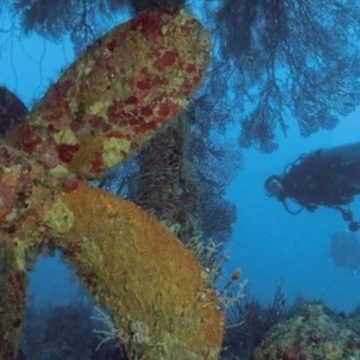 Grenada claims to be the “Wreck diving capital of the Caribbean” (as does Aruba). There are 15 wrecks of varying types and at varying depths around the island. Some were genuine wrecks others have been placed, but all 15 are now artificial reefs, each one a mini eco-system. 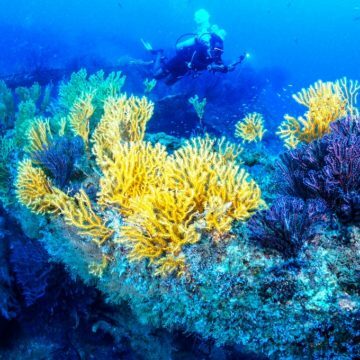 They are decorated with colourful sponges, large gorgonian sea fans, soft corals and provide a home to many different species of marine life – including rare species like the Black Brotula. The star of the show is the Bianca C, the largest wreck in the Caribbean, an amazing sight at 180 metres long. The decks are accessible to divers, in 27 metres of water. The Bianca C is listed as one of the top ten wreck sites in the world by several diving magazines. In 1961, when the Bianca C sank, hundreds of Grenadians rushed to the aid of those onboard. 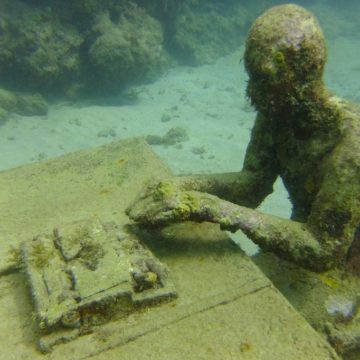 A statue known as the ‘Christ of the Deep’ stands on the Carenage, the quayside in St. George’s, as a tribute to the kindness shown by the people of Grenada. Depending on qualification, divers are able to access several wrecks. 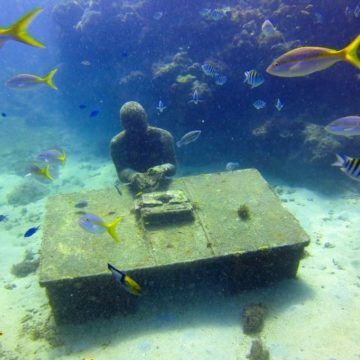 English artist Jason Taylor has installed sculptures around 10 metres deep, to form a unique underwater exhibition. 26 life-sized sculptures of local children holding hands and form a circle, while a man rides his bike home – and another works at his desk! They are positioned to enhance the reef, complementing the reefs topography. The sculptures have been successful in attracting a fascinating variety of marine life. ‘National Geographic’ recognized the Sculpture Park as one of the ‘Earth’s Most Awesome Places’. 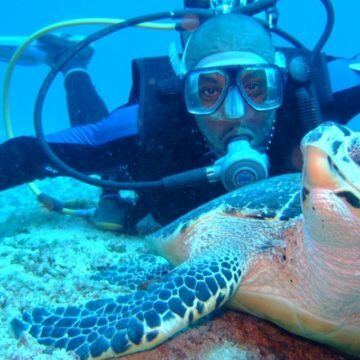 The Grenada government has imposed restrictions to protect the natural world, on land and underwater. The Marine Protected Area (MPA) is a protected marine park just north of St George. The reef comes to within a couple of metres of the surface – and has a covering of mixed black, soft and hard corals. Also protected are the sea grass beds and some beaches, important to turtles for food and as hatcheries, as well the mangroves, important nesting areas for birds and spawning grounds for fish. Grenada is around 12 miles across by 21 miles long. There are over 50 dive sites around the island, the majority off the south west coast, the sheltered coast, in the Caribbean Sea. Most of the accommodation we offer is on this coast, so you are never far from the ocean – or a dive site! There are around 30 dive sites close to this shore and an extensive coral reef, Boss Reef, extends up to 5 miles from the harbour at St Georges to the southern tip of the island. 20 dive sites are between Grenada and Carriacou, a largely undeveloped island, 15 miles to the north, surrounded by magnificent, pristine reefs. 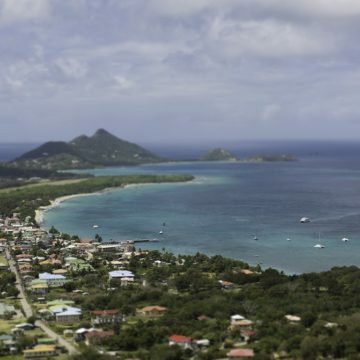 Carriacou gets its name from the Carib Indian word for “isle of many reefs.” Most sites have little or no current. Sites near the open ocean experience some currents, and there are some nice drift dives over wonderful coral gardens and impressive wrecks, possibly accompanied by sharks, rays or turtles. However, there are also lots of sheltered bays – you are unlikely to miss any diving days. Some sites will give you a clue as to what you’ll find – like Shark Reef ! Sites vary in depth from 2 metres to 45 metres and, with very easy ocean conditions, this means they are ideal for divers and snorkellers of all levels. Some sites can be accessed from the shore, but most diving and snorkelling is by boat. Most reefs, wrecks and walls are close to shore, so it ís not an “epic” voyage. Boat journeys take between 10 and 30 minutes. There is a hyperbaric chamber at St. Augustine’s medical center. Snorkellers will enjoy the easy conditions, warm, clear water and the absence of currents. Shallow reefs and wrecks give snorkellers a rare opportunity to see spectacular wrecks as well as the beautiful, colourful marine life, clearly visible from the surface. Snorkelling in warm, shallow water is a great way to introduce children to the wonderful underwater world. There are many guided snorkel trips or you can join one of the dive boats. 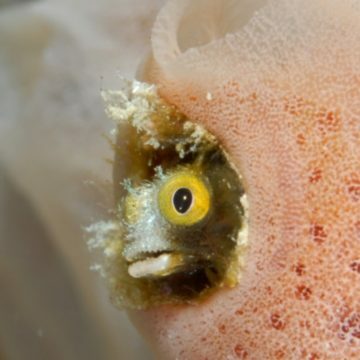 Photographers love the variety of features and marine life. The shallow water allows lots of natural light and the absence of serious currents makes the process a lot easier. There are many photographic specialists on island and some run photographic courses. Custom dive boats take small groups, usually around 6 to 8 divers and snorkellers, to the sites 2 or 3 times per day. At most sites there will be just you and a few (new) friends – very relaxed and comfortable. As these are small groups, availability is limited. Any diving you wish to do should be booked before your arrival on island. 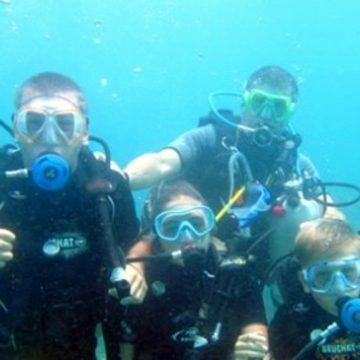 Grenada is good for families and groups of divers and non-divers. The dive centres are generally on the excellent beaches in the south west. Non-divers can enjoy the creature comforts and the best beaches. Divers and snorkellers can enjoy many sites together. The relaxed and safe atmosphere enables you to enjoy the perfect weather in peace. The reef is close to shore, so if you are snorkelling or diving you are not away for long and never far from shore. 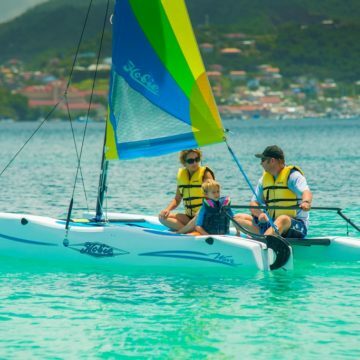 Grenada has some wonderful beaches, with water sports and there are many land-based activities for the whole family to enjoy. We are an ATOL bonded, diving holiday specialist for Grenada. We work closely with the dive centres on Grenada who have everything divers and snorkellers might need. They offer boat diving, guided dives, night dives, equipment for sale or hire and instruction courses for all levels, including complete beginners and youngsters. The Caribbean is a great place to take a referral or refresher course. We tailor-make holiday itineraries, which can include all your diving requirements, to ensure you get the best from your diving holiday. We know how the diving works and have prices lower than you would pay on island. We will book your diving with our dive operator partner, at your accommodation, or nearby. On a small island services like diving, instruction courses, excursions, vehicle hire etc., get booked up quickly. 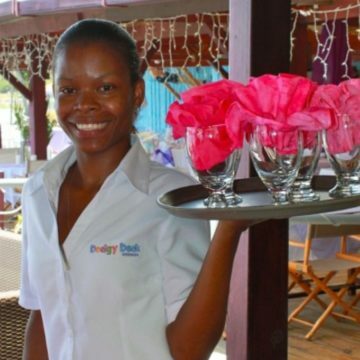 It is important to reserve any services you may want for your holiday, before you arrive on Grenada. Booking with us saves you money and ensures those services are available to you when you arrive on island, avoiding any disappointment. Those services then become part of your ATOL protected holiday itinerary. Grenada has a wonderful location. The west coast faces the Caribbean Sea and the east coast faces the Atlantic Ocean. 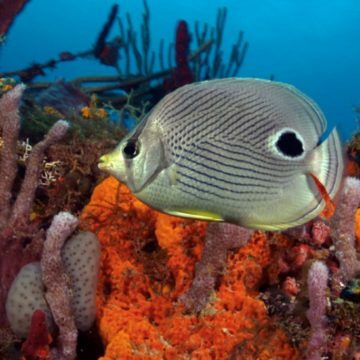 The Caribbean Sea has warm, calm water, full of colourful, tropical species. Atlantic ocean currents enrich the waters around this small island with nutrients which attract larger marine creatures. The best of both worlds. Grenada was formed by a volcano many years ago and the dramatic underwater rock and coral formations provide yet another dimension for marine life. The underwater scenery in Grenada is every bit as breathtaking as it is above the surface. Combined with varying ocean conditions, they provide a huge variety of habitats – home to wonderful diversity of marine life. From colourful reef creatures, parrotfish, angelfish etc., to larger ocean roaming creatures – turtles, rays, and sharks etc. The underwater scenery in Grenada is every bit as breathtaking as it is above the surface. Grenada has extensive coral reefs which are second to none. 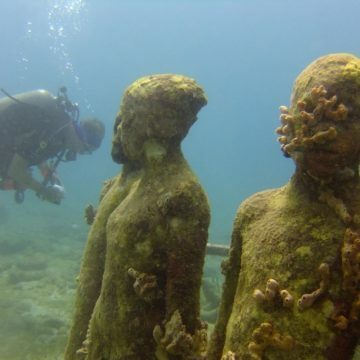 Peace and quiet, warm, clear water, pristine reefs, stunning wrecks and Grenada’s unique Underwater Sculpture Park. Whether you like wrecks, reefs, seahorses or sharks – Grenada has something for snorkellers of all levels. The snorkelling in Grenada is some of the best in the world. 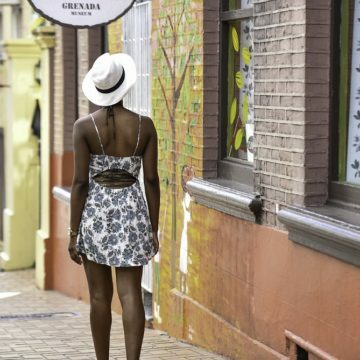 Grenada has no mass tourism – no crowds on Grenada – in our out of the water. Reefs, wrecks and walls remain unspoiled by crowds and many have yet to be explored. The snorkelling couldn’t be more comfortable and relaxed. The visibility of the crystal clear water varies from 15 to 35 metres. The water temperature can vary according to whether it is the Caribbean or Atlantic side of the island, but it ranges from 25ºC to 28ºC – even at the cooler end its nice wand warm. The Atlantic and southern coasts generally have some current, which can be strong at times. Although if you are snorkelling these coast you will probably be on a boat and they will always select sites to suit your abilities and the prevailing conditions. The accommodation we offer is on the calm side of the island, and there are lots of sheltered bays. Even when the ocean is a little choppy, you won’t miss any snorkelling days. There are too many species to mention, but in the clear, warm water snorkellers can expect to see creatures like : brilliant orange and purple fairy basslets, stoplight parrotfish, surgeonfish, queen triggerfish, schools of squid, green and hawksbill turtles, stingrays, electric rays, eagle rays, barracuda, giant lobsters and giant green moray-eels, sea horses, shoals of horse-eye jacks, banded coral shrimp, nudibranchs, octopuses, squirrelfish, trunkfish, Creole wrasse, southern stingrays (often more than 10 at a time), southern sennets, rainbow parrotfish, frogfish, sergeant majors, brown chromis and Creole Wrasse. 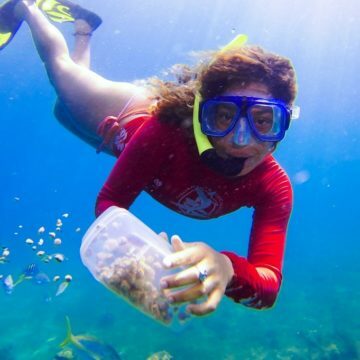 Look out for “cleaning stations” staffed by hundreds of wrasse. Good snorkelling spots include the sand and sea grass beds with torpedo rays, electric rays, cushion sea stars, magnificent sea urchins, flying gurnards and head shield slugs. Hawksbill and Leatherback turtles have nesting grounds around the islands and are a common sight in spring and summer. A large population of Nurse sharks live and breed around the Atlantic dive sites. 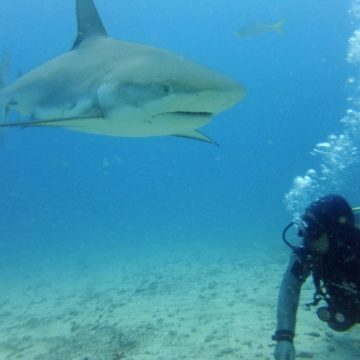 Grenada offers one of the best spot to encounter sharks in their natural habitat. From December and April Grenada’s waters are visited by various whale species, including Orca whales, Curvier beaked, humpback and sperm whales. Fifteen species have been recorded in ocean around the island. During the year pilot, Bryde’s, sperm, pygmy and Sei whales can be seen as well as several varieties of dolphin. The reefs consist of large star coral boulders, black coral, fire coral, elkhorn coral, and towering pillar corals which, with the dramatic lava formations, provide shelter to a wide variety of marine life. The reefs are covered with gorgonians, ball sponges, rope sponges, sea fans, azure and purple vase sponges and glorious barrel sponges. The coral reefs are extensive and in some cases come to within a couple of metres of the surface. You will see pinnacles, the tips of underwater mountains, rising up to within 10 metres of the surface. Crystal clear water means that snorkellers will get an excellent view of the reefs and the amazing marine life that live on them. Most diving and snorkelling is off the south west coast, the calm side facing the Caribbean Sea, which has an extensive coral reef, Boss Reef, which extends up to 5 miles from the harbour at St Georges to the southern tip of the island – a perfect habitat for many tropical species. The accommodation we offer is around this south west corner, on the calm side of the island, close to the se excellent sites. There are some wonderful coral gardens, lots of colourful reef creatures and some ocean roaming creatures, sharks, rays and turtles. There are more than 50 dive sites around Grenada, 15 are wrecks in varying depths, and the island’s south west coast has a superb fringing coral reef. Most diving and snorkelling is off the south west coast with around 30 excellent sites close to shore. New sites have recently been found between Grenada and Carriacou, a largely undeveloped island, surrounded by magnificent, pristine reefs. 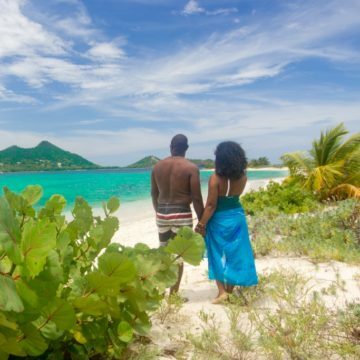 Carriacou comes from the Carib Indian word for “isle of many reefs”. The reef and some of the wrecks are in relatively shallow water and with fantastic visibility in crystal clear water, snorkellers can enjoy some of these historic shipwrecks. The designated dive sites vary in depth from 3 metres to 36 metres. These sites are important for snorkellers as they are internationally recognised as premium sites – with interesting features and creatures. Some sites can be accessed from shore – some reefs are 80 to 100 metres from the beach. Most are easier to get to by boat and most reefs, wrecks and walls, are within a 15 minute boat ride from the beach. You can easily jump on a dive boat and enjoy an hour and a half hour snorkelling. Boats usually go out three times a day and only take small groups typically just 6 to 8 people – so the sites are deserted, just you and a few (new) friends. We boarded our boat from the Grand Anse beach – and a nice easy 10 minute ride took us to Moliniere bay. The boats leave from the beaches and you can enjoy the creature comforts of the beaches and some of the best snorkelling in the world. Divers and snorkellers can enjoy many sites together. Snorkelling couldn’t be more relaxed and convenient. There are 15 wrecks, in varying depths, around the island. Several are in relatively shallow water, and with excellent visibility, snorkellers will enjoy these historic sites too. These fascinating wrecks have provided a new habitat for many species of marine life. They have been colonised by deep water sea fans, sea whips, sponges, soft and hard corals. There are rare sighting of species like the Black Brotula and some of the more elusive ocean roaming creatures. Schools of jack, barracuda, snappers and spotted eagle rays – stingrays, turtles and nurse sharks. Look out for coral-encrusted anchors, some dating back to the 1800’s. Bushy black corals trees grow on the decks of many wrecks with white, orange and green varieties growing on the interior walls. 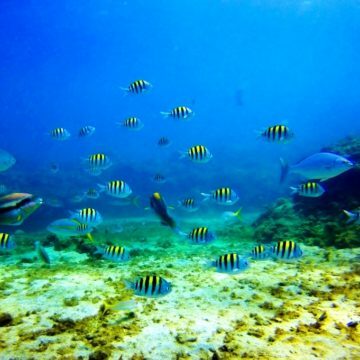 Grenada’s government has introduced measures to protect the health and diversity of the underwater world around the islands. 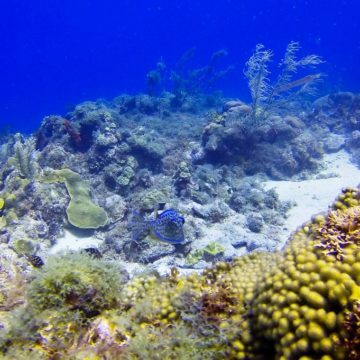 The Marine Protected Area (MPA) is just north of St George and has excellent reefs some of the best sites on the island are within the boundary of the MPA. Snorkellers will see nearly every kind of coral imaginable, along with an abundance of marine fish life, pelagic and coastal. Moliniere Bay – known to have the most abundant marine life on the island. This is a sheltered bay and the top of the reef comes to within 2m of the surface ! The unique ‘Underwater Sculpture Park’ is in Moliniere Bay, in the Marine Park. ‘National Geographic’ recognised the Sculpture Park as one of the ‘Earth’s Most Awesome Places’. 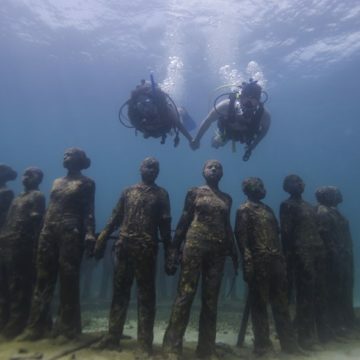 The sculptures of local people are on the sea floor around 9 metres down. Look out for the man on the bike ! Dragon Bay – ideal for all snorkellers – this colourful, shallow reef has beautiful sponges, black corals and colourful reef fish and “little dragons” – sea horses. It is a good spot for octopus, southern stingray and lobster. It is a in a sheltered bay in Grenada’s Marine Protected Area. Flamingo Bay – one of the most beautiful sites on Grenada. Aquarium Beach – a favourite spot for locals and visitors. The best snorkel site in Grenada just 50 metres from the white sandy beach. Big leatherback turtles use the beach as nesting grounds. Boss Reef is an extensive reef system that extends up to 5 miles from the harbour at St Georges to the southernmost tip of the island. We work closely with the dive centres on the island. If you want to take some boat trips, special courses or excursions, you should book in advance. Boat trips and excursions are in small groups and can get booked up. 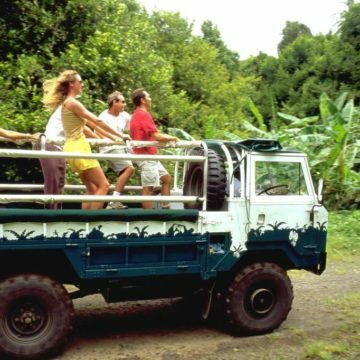 You may also wish to hire a vehicle to explore the island. We have the best rates for vehicle hire and we have worked with a reliable hire company for many years. Booking your on-island services with us is a little cheaper and we can include that into your ATOL protected holiday itinerary. The aroma of the “The Isle of Spice” will relax you – and “doing nothing” is always an option but this small island has a number of places of interest and activities to enjoy. The island has a wonderfully comfortable climate, in which you can enjoy your holiday – no matter what type of holiday activity you prefer. Although Grenada is well known as a sunny and safe holiday island – the island is remarkably quiet and undeveloped. No crowds – no rush. here. Visitors can enjoy the island in a relaxed atmosphere, making it easier to explore and be a little more active. 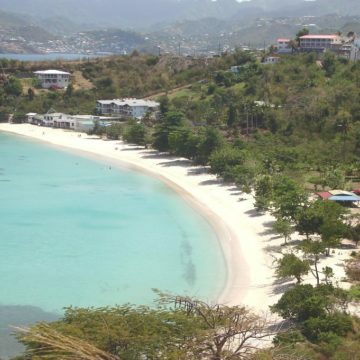 Grenada has 45 wonderful beaches, all of which are officially public beaches. 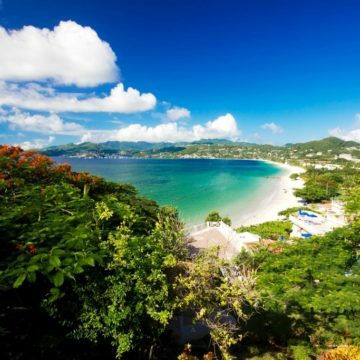 Grand Anse Beach, on the sheltered south west coast, is “officially” one of the best beaches in the world, a smooth expanse of soft sand stretching for two miles around the gentle curve of the bay. This is the sheltered coats of the island and the sea here is calm, warm and clear. Most of our accommodation is close to Grand Anse. The beach is favourite with both locals and visitors. 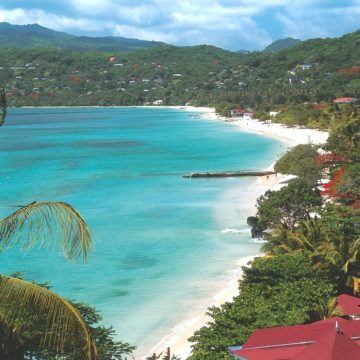 Grand Anse has water sports, scuba diving centres and the local area has shops, bars and several good restaurants. 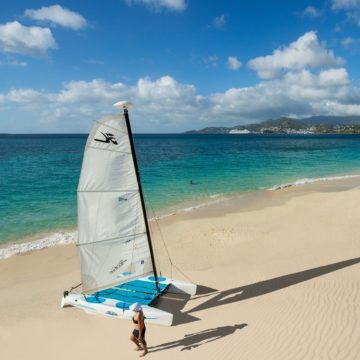 Grand Anse is the focal point for holiday activities but is still quiet and relaxed. Other beaches are secluded and quiet, with little more than some shade, like the superb Morne Rouge beach, our favourite, which is short walk from Grand Anse. Lots of beaches to choose from – and you can pick one which suits your preference. 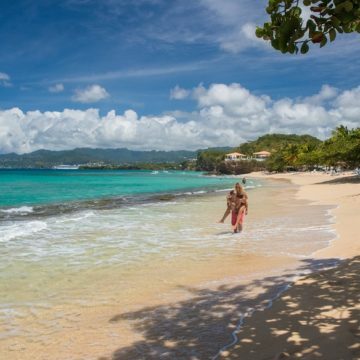 There are no ‘clothing optional’ beaches in Grenada. 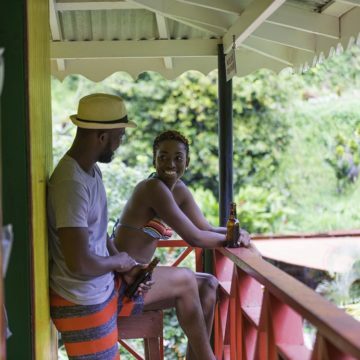 There are a lot of opportunities to take tours, like jeep safaris, or get out and about yourself, to enjoy the natural world, the historic forts, lakes, waterfalls, spice estates, floral gardens, rum distilleries (with generous samples) etc. 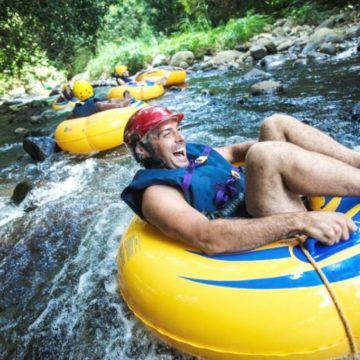 You can enjoy lots of fun activities like river tubing, hiking, rock climbing, mountain biking, horse riding, kayaking etc. There is a zip wire though the rain forest. An exciting, and fleeting, way to get close to nature. There are lots of facilities, in hotels and sports clubs, for visitors to enjoy the regular sports like golf, tennis, squash etc. The Caribbean Sea is famous for its warm, clear water. The easy, comfortable conditions are ideal for everyone that enjoys the ocean and water sports. The underwater scenery in Grenada is every bit as breathtaking as it is on land. 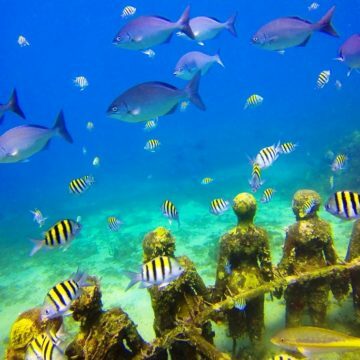 Divers and snorkellers will see nearly every kind of colourful coral and reef creatures, lots of wrecks including largest shipwreck in the Caribbean and the unique Underwater Sculpture Park. The Atlantic coast is often visited by larger, ocean roaming creatures like sharks, dolphins and whales. From December to April Grenada’s waters are visited by various whale species, including Orca whales, Curvier beaked, humpback and sperm whales. Fifteen species have been recorded in ocean around the island. 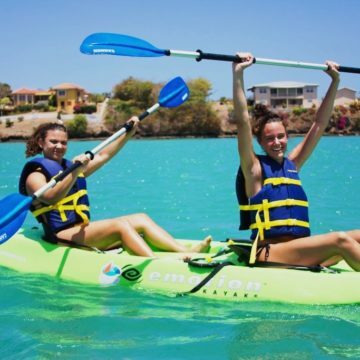 An extensive range of water sports are available around the island, kayaking, paddle boarding etc. The Atlantic coast has a steady onshore breeze, perfect for kite surfers, parasailers, windsurfers, and sailors – while inland you can enjoy river some exciting river tubing, kayaking etc. Ask us if you have a particular activity you like to enjoy. 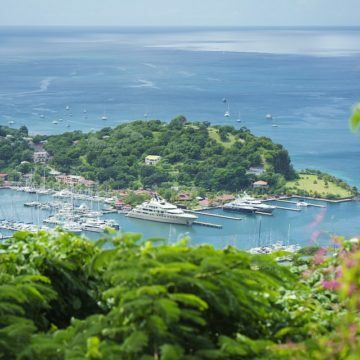 Grenada’s surrounding waters offer some of the best sailing in the Caribbean, and the island is one of the yachting centres of the Caribbean. Visitors can enjoy hiring a craft themselves or take a trip on one of the many boat excursions or evening cruises. 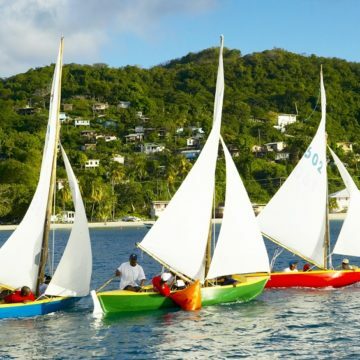 The Grenada Yacht Club organises several sailing events each year, most notably the Grenada Sailing Festival in February. Lots of charter companies offer day trips to some excellent fishing areas. 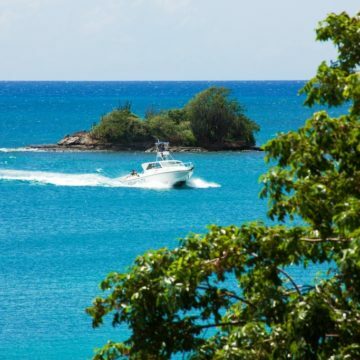 Grenada’s waters are famous amongst sports fishermen and the annual Spice Island Game Fishing Tournament attracts professionals from around the world. There are many excellent hiking trails on the island, maintained by the government, for you to enjoy. Some around the coast, some over the rugged terrain of the interior, with its jungle-like rain forest. Many are paths carved out by the first settlers on the islands, with wonderful scenic views, getting you close to the island’s flora and fauna. 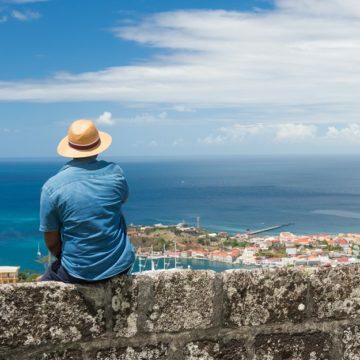 There is so much to see in Grenada, historic forts, lakes, waterfalls, spice estates and plantation houses – some of them still operational – spice gardens, floral gardens, rum distilleries, Amerindian petroglyphs, Grand Etang Nature Reserve famous for its crater lake, Mt. St. Catherine at 840 metres (highest point on Grenada) and more. 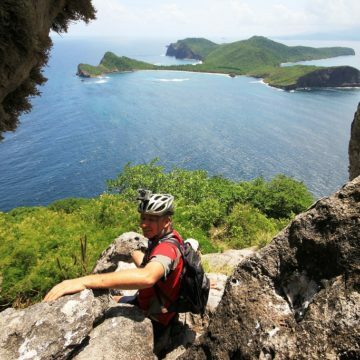 Many of the trails on the island can also be enjoyed by bike – some nice and easy – some a little more challenging – as you would expect on an island with such a varying topography. 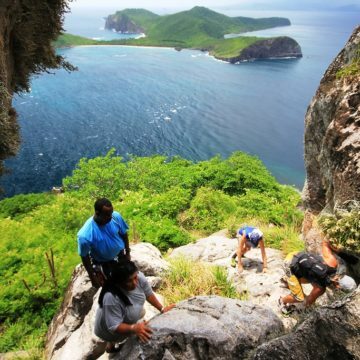 Some wonderful mountain tracks through jungle like rain forest, past waterfalls and volcanic crater lakes – or along coastal paths with wonderful views of the Caribbean Sea. The Grenada Golf & Country Club is a nine-hole course located near Grand Anse. Facilities include club rental, instruction, a clubhouse offering snacks and a bar, and caddy service. There are public courts at Grand Anse. Many hotels have tennis facilities. If your hotel doesn’t, hotels with courts are happy to allow non-residents to use their courts. 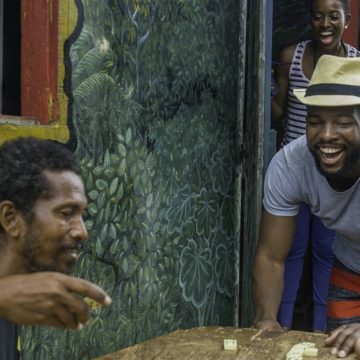 The Caribbean is the birth place of many popular dances – and dance workshops and studios welcome visitors. Let yourself go and revel in the Caribbean rhythm. 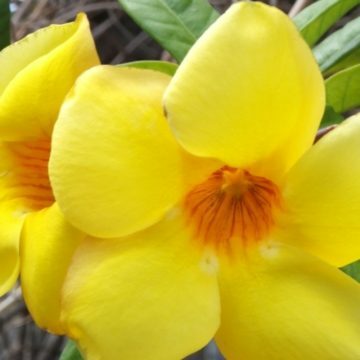 Lose yourself in the therapeutic pleasures of a spa ñ on a Caribbean island that already offers its own home grown “aromatherapy” with the soft scent of all the spices on the island. Lots of spas to help rejuvenate you – and several yoga studios. Most shops are in the capital, St. George’s. The Grand Anse area has a number of shops as well as a craft and spice market close to the beach. St. George’s bustling market square is an experience not to be missed – it’s a proper market – an opportunity to buy locally produced spices: nutmeg whether whole, jam, jelly, syrup or another form. Mace, cinnamon, ginger cloves, vanilla, turmeric etc. 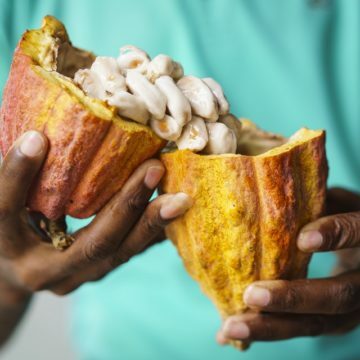 Grenada makes some of the best rum and chocolate in the world. The market also has many craft stalls. We can book vehicle hire, activities, tours or excursions for your holiday. 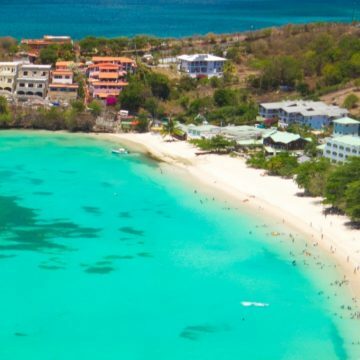 Grenada is a small island just twelve miles by twenty-one. Due to the limit on commercial development you can enjoy the sights – in peace and at your own pace. The historical sites and nature spots are never crowded. The island’s dramatic topography is probably the most varied in the Caribbean. The exciting mountainous terrain, a long-extinct volcano, is covered with a dense rain forest giving Grenada a breathtaking natural beauty. A mountainous, volcanic terrain, with waterfalls, crater lakes, a staggering variety of plant and animal life, mountain rain forests and lowlands that lead to a mangrove coast or brilliant white sandy beaches. 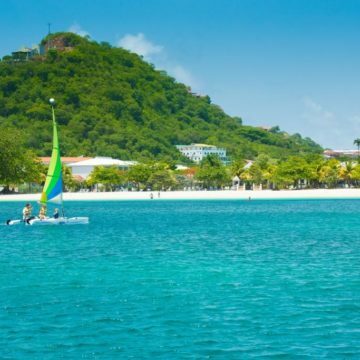 Grenada has a magnificent coastline with beautiful beaches and bays sculptured by the bright blue ocean. 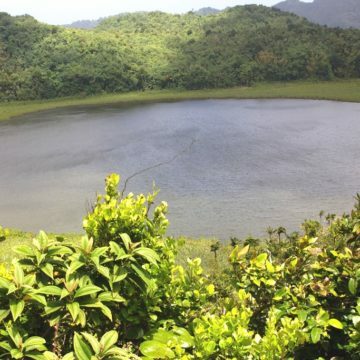 The Grand Etang Lake is a crater lake surrounded by dense tropical forest, part of the island’s Forest Reserve, in the crater of the extinct volcano. There are excellent hiking trails in the area, with wonderful views. 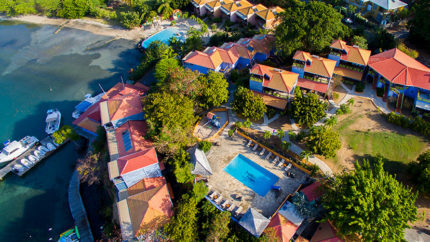 The Reserve typifies Grenada’s exciting natural features – rain forest, lakes, waterfalls, hot springs and plantations. Look for the unusual Mona monkeys – not native to the Western Hemisphere. 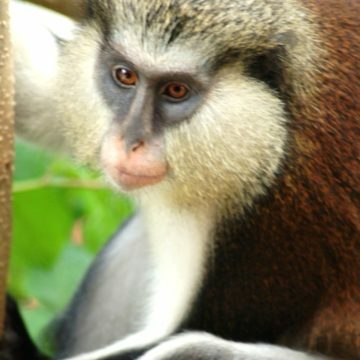 They are Old World monkeys – introduced from Africa. Mt. Qua Qua is a mountain within the Grand Etang Nature Reserve and Mt. St. Catherine is, at 840 metres (2756 feet) high, the highest mountain in Grenada. Mangroves, along the eastern/Atlantic side of the island are nesting areas for many birds and spawning grounds for fish. The variety of land and marine life in and around the mangroves is stunning. Levera National Park a 450-acre park, Grenada’s most scenic coastal area. It has a beautiful beach and lagoon – one of the most important wildlife habitats on the island, not least a wide diversity of birdlife. 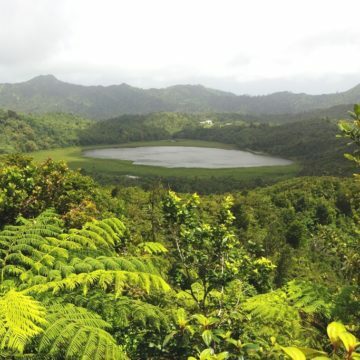 Lake Antoine National Park has a trail around the crater lake, a beautiful walk, another of Grenada’s many excellent locations for bird watchers. La Sagesse is a quiet mangrove estuary one of the best bird-watching spots on Grenada. Annandale Waterfalls St. George – a short drive from the capital. Concord Waterfalls, St. John – these high, powerful falls are exhilarating. Royal Mt. Carmel Waterfalls, two miles south of Grenville, also known as the Marquis Falls, the highest on the island. Two falls cascading over 70 feet into the pools below. Seven Sisters, Grand Etang – seven waterfalls – along rugged trails. A guide is advised. Victoria Waterfalls, St. Mark – towering falls, for the more adventurous. Honeymoon Waterfall is secluded in the rain forest close to the Seven Sister Waterfalls. A striking reminder of Grenada’s fiery beginning – hot springs. One of the easiest to get to is the Claboney Hot Springs in Grenville. The springs are not sulphurous, there’s no charge to visit the spring. River Sallee Boiling Springs in the north east of the island, are noted for their unique geology and as an area of spiritual importance for the local residents. Grenada National Museum Corner of Young & Monckton Street St. George was opened in 1976. The building, built by the French in 1704, was part of the foundations of Fort George complex. The British used it as a prison until 1880. Grenadian historical artefacts and exhibits. 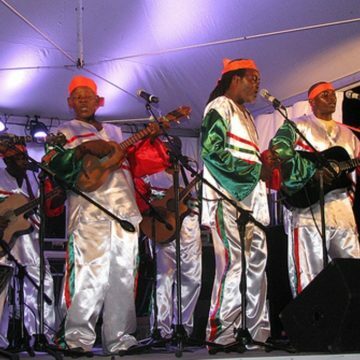 Weekly cultural performances. 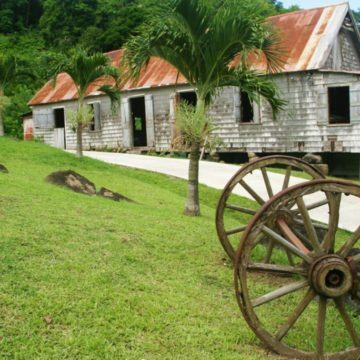 The Carriacou Museum in Paterson Street, managed by the Carriacou Historical Society has Amerindian artefacts and exhibits tracing the early British and French occupation of the islands. It also has an African section. The museum is housed in a restored cotton gin mill. 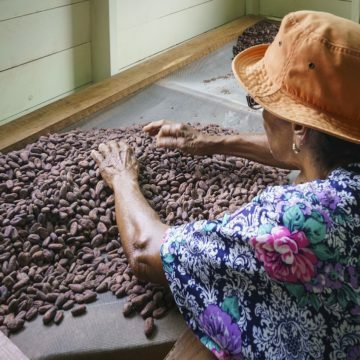 Dougaldston Estate is the oldest Spice Plantation in Grenada – close to Gouyave in the parish of St John. Gouyave Nutmeg Processing Station is one of the largest nutmeg processing factories on the island. 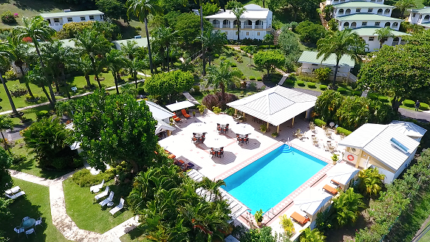 Belmont Estate, St Patrick an hour’s scenic drive from St. George – gives visitors a taste of Grenada, its history, culture, flavours and traditions. 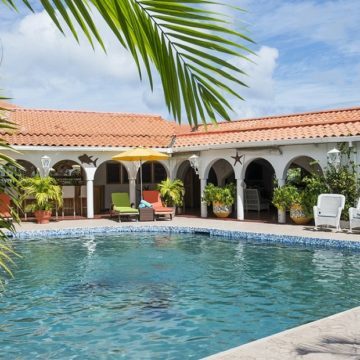 Set in 400 acres of lush rolling hills in the north of Grenada. Lots of amenities for visitors. 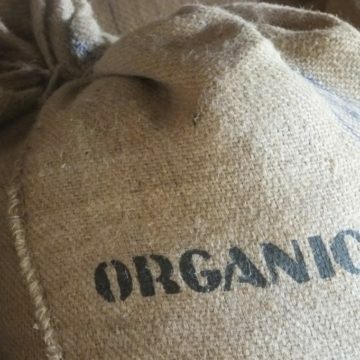 Belmont Estate and the Grenada Chocolate Company, make the finest dark organic chocolate. Grenada is famous for its rum. The three largest distilleries are Clarke’s Court, Westerhall Estate and River Antoine. 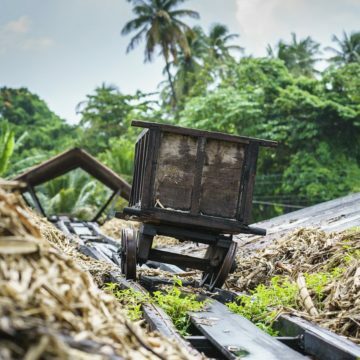 All three have tours that demonstrate the production of rum. River Antoine Rum Distillery, St. Patrick is the oldest Rum Factory in the western hemisphere and still operating with a water wheel. Clark’s Court Distillery, in the St. George district, famous for high quality light and dark rums. Westerhall Rum Distillery, St. Davids, makes a family of award winning rums. The 500 acre Westerhall Estate in St. David’s has the oldest working waterway in the western hemisphere. Fort George above the main town of St. George¥s with a beautiful view of the town and the Carenage. 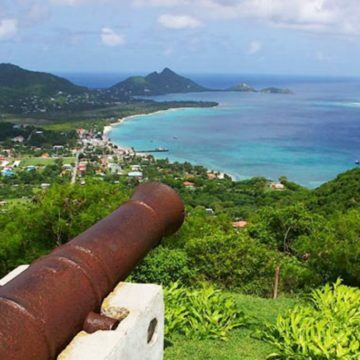 Fort Frederick high above the sea with outstanding views of St. George’s, Grand Anse, Grand Etang and the southern part of the island. Fort Matthew stands on Richmond Hill in the town of St. George – the largest fort on the island, named after the governor at the time, Lt. Governor Edward Matthew. The 18th century bathrooms, army kitchens, underground tunnels and cells used when the fort was an asylum are just a few of the gruesome, yet intriguing, features still found within the fort. There is a breathtaking view of the town of St. George. 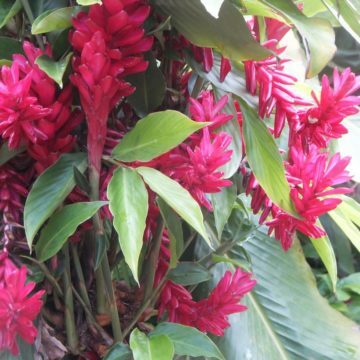 Grenada is proud of its many excellent floral gardens. 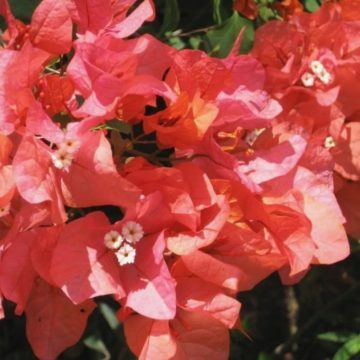 Grenada won its 7th Gold Medal at the Chelsea Flower Show in London in 2009. 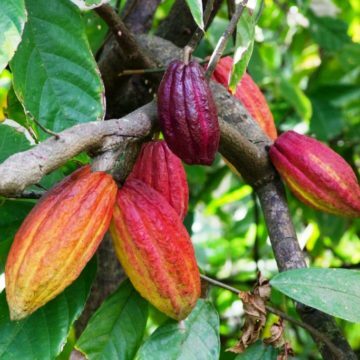 Grenada, Carriacou and Petite Martinique boast gardens with a very diverse range of flora: spices, herbs, tropical plants and exotic flowers. De La Grenade Nutmeg Garden in the lush, green hills of St. Paul’s, is a memorable experience, a perfect complement to a visit to De La Grenade Processing Facility. Hyde Park Tropical Garden, one of Grenada’s finest gardens, has a variety of palms, cycads, heliconias, bougainvillea, other colourful, tropical plants. Jessamine Eden Tropical Botanic Garden in the foothills of the Grand Etang Tropical Rain Forest, is over 60 acres of tropical gardens, organic farms and rain forest trails within the Grenville Vale Estate in St. Georges. Laura’s Herb & Spice Garden, near Perdmontemps in St. David, has numerous examples of trees, herbs and spices grown on the island. Smithy’s Garden is noted for its “wild feel” and also for the variety of rain forest plants which flourish in an area noted for its dry forest vegetation! Bay Gardens a tropical Garden with a rain forest style – located in the St. Paul’s area of St George’s. Spice Basket, Beaulieu St. George. A pleasant 3 mile journey, through Grenada’s hilly, “jungle” covered countryside, to the ‘Home of Our Culture’. Annadale waterfall and Grand Etang Lake are along the same route. The blend of island attractions and experiences at ‘Spice Basket’ provide a fascinating cultural profile. Black Bay Beach is a 20 minute hike from the Concord main road. This black sand beach is in a secluded spot in the parish of St. John and Black Bay Cave has some old Amerindian markings. Carib’s Leap, in the north of the island where, legend says, the last Carib Indians jumped from a high cliff after failing to repel the colonists. Mt. Hartman Dove Sanctuary, close to the scenic Woburn Bay, the Mt. 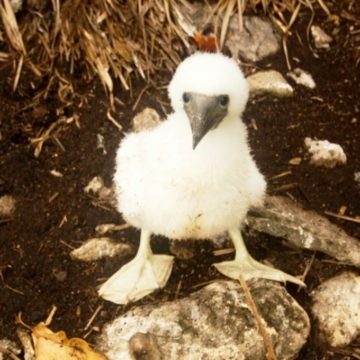 Hartman Dove Sanctuary is the home of the protected Grenada Dove – Leptotila wellsi. We would not usually include beaches in sightseeing information. But there are 45 breaches on this idyllic island – some striking black sand – other silvery white sand. Some large and expansive – other small and secluded, in small coves dramatically enclosed by volcanic cliffs – which put them on the list of sights worth seeing ! 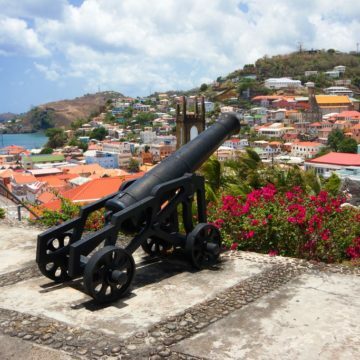 There are lots of organised tours to all the sights and attractions Grenada has to offer. There are other ways of sightseeing and exploring ñ hiking, cycling, hiring a vehicle, buses and taxis. We can send you more information if required. We can also arrange tours and vehicle hire as part of your holiday itinerary. There is a regular ferry service Carriacou and Petit Martinique. 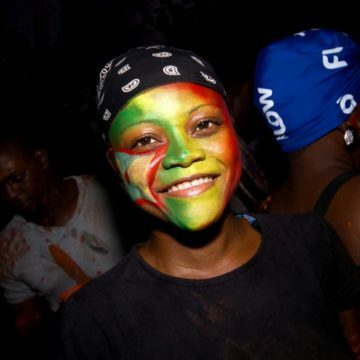 Grenada’s nightlife is easy going, lively, often quirky, but never hectic or “forced”. There are a few favourite night spots where visitors and locals go to have fun. One very encouraging aspect is that locals and visitors mix freely. This was a huge plus for me. I am sure being able to relax and not feel like a tourist is a welcome change for all visitors. 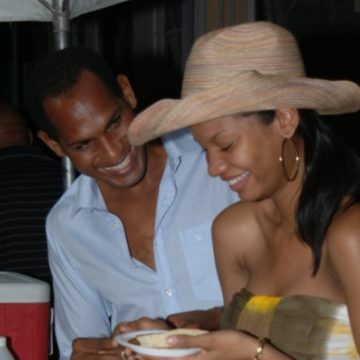 The nightlife has that wonderful Caribbean exuberance and the island’s character makes it friendly and fun. 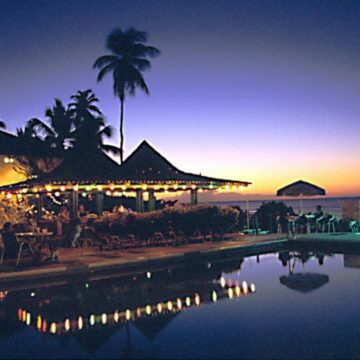 Most nightlife is in the Grand Anse area. It’s an easy to walk to restaurants and bars from most hotels and resorts. Although hotels also provide entertainment and you will find something that suits all tastes – from the lively to the more relaxed. 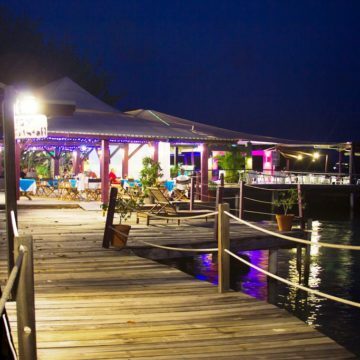 The clubs and bars feature all the popular music, often live music, including Calypso and Reggae. Sunset cruises are a great way to enjoy the fantastic sunsets ! 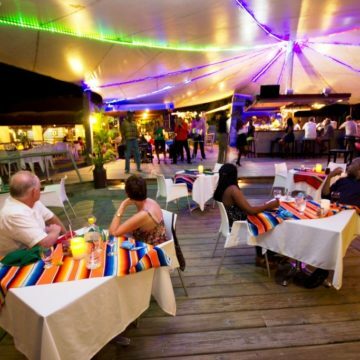 Grenada has a number of excellent restaurants ñ and a marvellous variety of cuisine, due to its rich cultural heritage. West Indian/Creole food, of course, but French and Spanish are also strong influences. There are also English, Italian, Indian and Chinese restaurants. You can enjoy your meal under the stars or the sun, while you listen to Caribbean music, sipping a cocktail. Many of the better restaurants are inside resorts and hotels. There are restaurants to suit all tastes – from ordinary cafes serving local food to the Garry Rhodes restaurant serving international cuisine. Even the small cafes I ate in, like “Good Food” in Grenville, were good value and really tasty food. You can dine on five-course gourmet meals or grab a bite in your shirt and shorts. 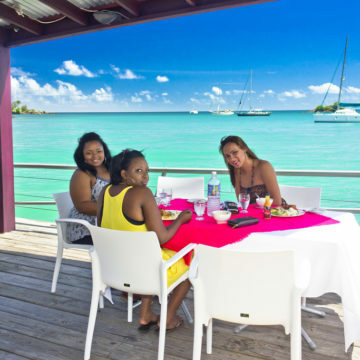 Patrick’s – favoured by the yachting fraternity – close to the harbour in St. Georges. De Big Fish – at the Spice Island Marina in True Blue. Live music on occasion. Creole Shack – evening entertainment Sports Bar, Restaurant setting – Karaoke on Friday and Saturday night. 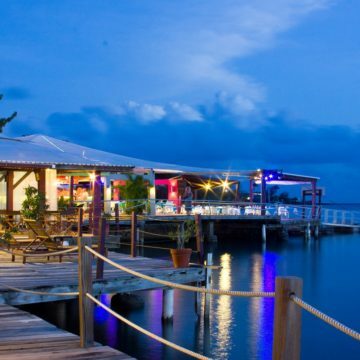 Aquarium Restaurant – great Sunday BBQ – great location on the beach. 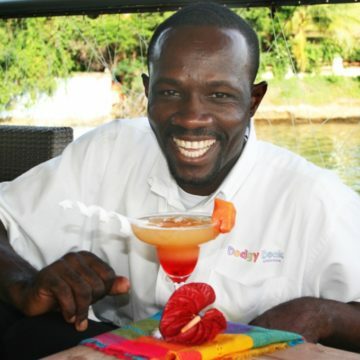 Umbrellas Beach Bar – famous ‘liming spot’ – great homemade burgers. Pirate’s Cove Restaurant – local food at modest prices. Excellent view of the island. La Luna Restaurant, Morne Rouge – Italian and Caribbean cuisine – ingredients from their own organic garden. Featured in Conde Nast Travellers as “Top 100 tables of the World”. 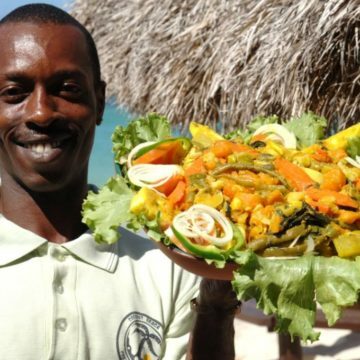 La Sagesse Beach Restaurant – Caribbean cuisine on a beautiful, palm shaded beach. The bill will usually include an 8% government tax, and occasionally will include a 10% service charge. Restaurants may quote prices in United States dollars, Eastern Caribbean dollars, or both. Be clear about the currency – there is a big difference between the two dollars ! Grenada’s national dish is called “oil down”. It is a simple but delicious dish, and you’ll see it everywhere. It’s a stew of salted meat, chicken, dumplings, breadfruit, callaloo and other vegetables – in coconut milk, herbs and spices. Pepper Pot: different kinds of meat, cooked with a lot of pepper, garlic, onions chive and thyme. Roti: beef, chicken or vegetables, cooked with lots of curry and potatoes. Lambie Souse (conch): has a delicious smoky after taste. 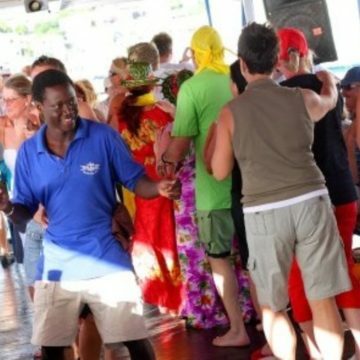 Grenada has several modern clubs playing dance music most nights and with live music at weekends. Fantazia Disco on Morne Rouge Beach. Dodgy Dock Bar & Restaurant. Bananas in the True Blue Bay area – Good for food and night life. Latin dance every Tuesday and Thursday. There are other nightclubs and usually a party going on somewhere, all very friendly and relaxed. 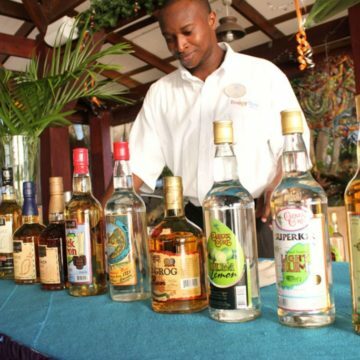 Note – in some bars drinks are made with “over-proofed” rums. Gouyave is regarded as the town that never sleeps. A real event this – a great evening out. It is a street festival – so it is as casual as it gets. From your accommodation it’s a nice drive to this West Coast fishing village. Fish Friday is very popular with visitors and locals. The food is very fresh and inexpensive, served from stalls lining the narrow back streets. Have something to eat and a couple of beers for less than $15 US. Lobster, shrimp and fish, fresh out of the ocean that day. Be careful of buying “sweets” – they are an acquired taste ñ and some are more sour than sweet – but it’s all part of life’s rich tapestry. Hotels and tour companies offer tours that will take you to Fish Friday or you can take a taxi. You pre-pay for a ticket – which you use to buy what you like from any of the stalls around the village – better than hassling with cash all the time. One of the real joys is of course, being able to relax, enjoy wonderful food, looking out over the ocean. You will have lots of opportunities to do that on Grenada. All of the dinners I had on the island were in just such a setting – overlooking the ocean or a tropical garden. We have eaten at various restaurants, hotels and cafes and happy to give advice if needed. Grenada, the islands of Grenada, Carriacou and Petite Martinique were formed by volcanic action many years ago – there is still an underwater volcano between the islands of Grenada and Carriacou. Lying beneath Grenada’s surface is some of the Caribbean’s most dramatic and unspoiled underwater scenery. The different rock and coral formations, with varying ocean conditions, provide a huge variety of habitats for a fantastic diversity of marine life to thrive. From small, colourful reef creatures to larger ocean roaming species – turtles, rays, sharks etc. Hawksbill and the leatherback turtles have their nesting grounds around the islands and a common sight in spring and summer. Grenada has no mass tourism. The island is relaxed and easy going. You can explore this wonderful island, easily and safely. 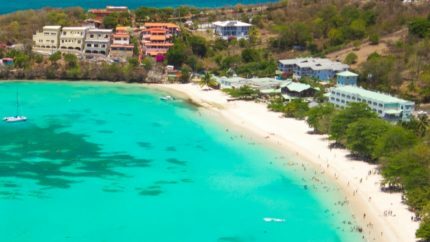 Grenada has a wonderful location for marine life, the west coast faces the Caribbean Sea and the east coast faces the Atlantic Ocean. The Caribbean Sea is famous for its diversity and abundance of marine life, colourful tropical fish and wonderful coral reefs. The island has an extensive coral reef system – a perfect habitat for many fascinating reef creatures. On the Atlantic coast currents from the open ocean enrich the waters around the island with nutrients which attract much larger, ocean roaming creatures. 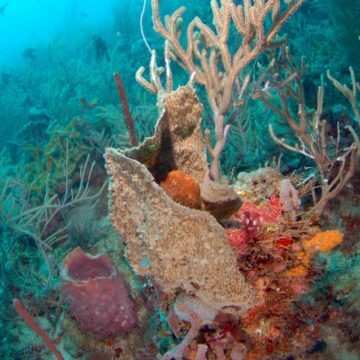 On Grenada’s north coast – between Grenada and Carriacou – many new reefs have been discovered. 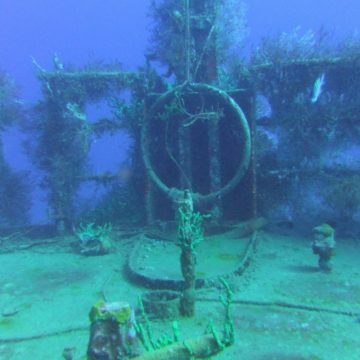 Grenada also has 15 shipwrecks in varying depths and locations around the island. 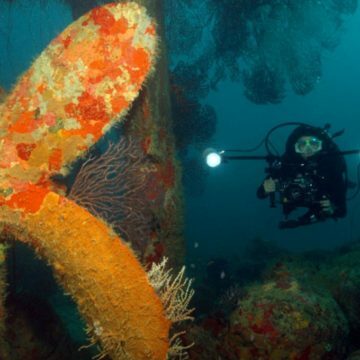 These wrecks provide yet another valuable habitat for marine life and have developed into outstanding artificial reefs. From December to April Grenada’s waters are visited by various whale species, including Orca whales, Curvier beaked, humpback and sperm whales. Fifteen species have been recorded in ocean around the island. During the year pilot, Bryde’s, sperm, pygmy and Sei whales can be seen as well as several varieties of dolphin. These coasts are exposed to Atlantic currents which attract large schools of snappers, stingrays, turtles, nurse sharks, large moray eels, shoals of Atlantic Spade fish and large grouper. A large population of Nurse sharks live along the Atlantic coast. 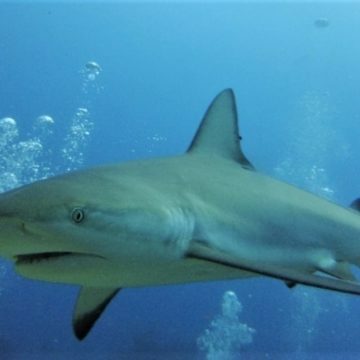 Grenada offers one of the best places to encounter sharks in their natural habitat. Marquis Island – off the east coast, was part of the mainland and now has eel grass marine environments and coral reefs. Nearby is La Baye Rock, which is a nesting ground for brown boobies and a great habitat for large iguanas. It is surrounded by coral reefs. Blue Lagoon – on the south east coast, large schools of snappers to stingrays, turtles and nurse sharks. Bianca C. – the largest wreck in the Caribbean – a 600ft cruise ship which sunk in 1961, lying in 167 feet of water. Encrusted with sponges, soft and hard corals. 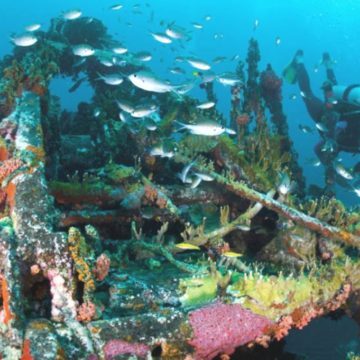 Buccaneer Wreck – Bushy black corals trees grow on the deck and side there are white, orange and green varieties. Telesto adorns much of the superstructure and there are lots of encrusting sponges and tunicates. Veronica Wreck – very picturesque, festooned with colourful soft corals, sponges and marine life – seahorses, moray eels and frog fish. Fiona Wreck – banded coral shrimp, anemone and nudibranchs, octopus, squid, mantis shrimp and more. Shakem – decorated with large gorgonian sea fans and soft corals. King Mitch – favourite haunt of sharks, rays and turtles. La Sagesse – is a mangrove estuary along the south-western coast with three fine beaches and an excellent coral reef and a salt pond. Levera National Park – has some excellent coral reefs and sea grass beds. The beaches are a hatchery for sea turtles, which are protected during their laying season, from May to September. 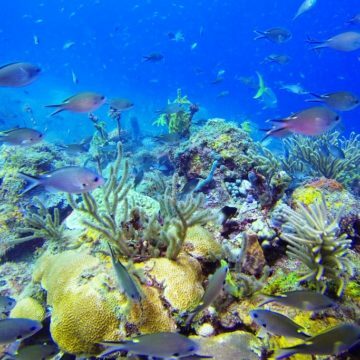 Moliniere Reef – has the greatest diversity of marine life on Grenada. The reef comes to within 6 feet (2 metres) of the surface in places. Large star coral boulders and several towering pillar corals encrusted with whip coral, black coral, sea fans, elkhorn coral, ball- rope- barrel- sponges, spotted drums, yellow tail snapper, yellow headed jawfish, frogfish, red band parrotfish, banded jawfish, long snout seahorses and many more. Larger species like turtles, stingrays, spotted eagle rays, nurse sharks, electric rays and lobster are common. Flamingo Bay – shoals of Creole wrasse, yellow chromis, grunts and jack knife fish, grouper, jacks and rays. The reef wall is encrusted with whip coral, an assortment of sponges and sea fans. 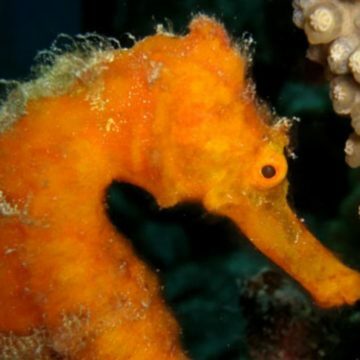 In shallower parts of the reef black seahorses have been seen. Aquarium Beach – schooling reef fish and rays, and in season big leather back turtles use the beach as nesting grounds. Dragon Bay – very colourful reef, beautiful sponges and reef fish and a common spot for octopus. In deeper water – southern stingrays and lobster. Nice coral garden with little “dragons” – seahorses. Fire-worms and spider crabs, soft corals and sponges. Boss Reef – is almost 5 miles long, from the harbour at St Georges to the southern tip of the island. An extensive, healthy reef and a perfect habitat for many tropical species. The upper reef with its rolling topography is home to lobster, banded coral shrimp, large tuna, jacks, nurse sharks, squirrelfish, spotted moray eels, trunkfish and hawksbill turtle and many, many more. Whibble Reef – pelagic species including huge schools of horse eye jacks, rainbow runner, wrasse, great barracuda, hawksbill turtles, nurse sharks and spotted eagle rays. Fantastic coral formations. Northern Exposure – schoolmasters, yellow tail snapper, Spanish hogfish and porcupine fish. Purple Rain – wonderful soft corals, large barrel sponges and a variety of file fish. Hawksbill turtles, rays and great barracuda and vivid purple Creole wrasse. Happy Valley – superb sponges as well as black and whip corals. 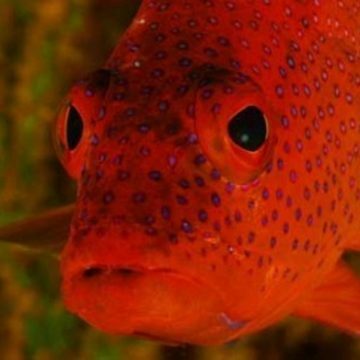 French angel fish, large grouper and lots of colourful reef fish. Japanese Gardens – colourful, soft coral growth, blue vase sponges, barrel sponges and gorgonian sea fans. Green and hawksbill turtles, porcupine fish, schoolmasters, yellow tail snappers, Spanish hogfish, lobster, sea horses, chromis, wrasse, squirrel fish and nurse sharks. 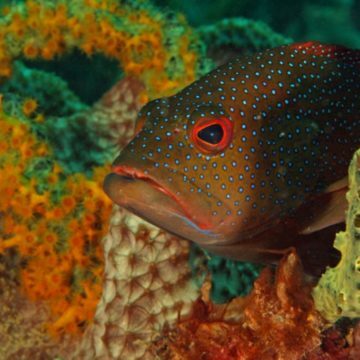 Red Reef’s Pinnacles – huge southern stingrays, large lobsters, turtles, spotted moray eels and lots of colourful reef fish – cleaner wrasse, neon gobies and Pederson cleaner shrimps, blue chromis, squirrel fish, parrot fish and butterfly fish. Shark Reef – Large brain coral and pillar coral formations. Lobster, nurse sharks stingrays, queen trigger fish and turtles. The wall itself is overgrown with deep water sea fans and sea whips. 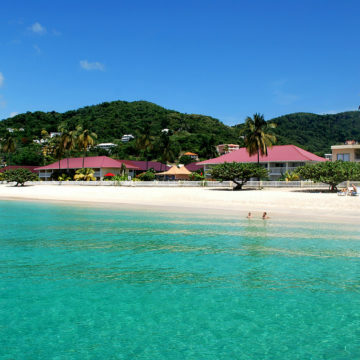 Flights to Grenada are with British Airways or Virgin Atlantic, two of the best airlines in the world. You can relax and start to enjoy your well-deserved holiday. The service on board is excellent – meals and drinks are free of charge – luggage allowances are higher and seats are more spacious than the usual “holiday” charter flights. 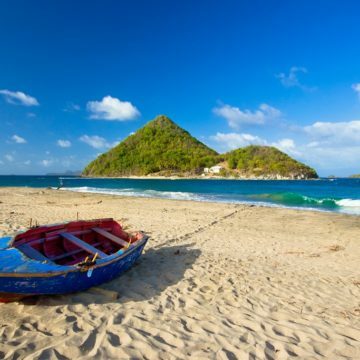 Flights to Grenada are direct with a short stop, both ways, on St Lucia of around 45 minutes. Grenada has no mass tourism and flight schedules need some work to get the best for you. We always check flights around your preferred departure dates AND the two airlines – to make absolutely sure we get the best price and schedule. Companies that lack that specialised knowledge – and automatic booking machines online – are unable to match that level of care and attention to your holiday. It is important to know, when preparing your holiday proposal, to know which days of the week you can travel ñ as we will always look for the best fare and schedule for you – and give you the best options for you to decide. Return flights are always overnight – giving you the opportunity to get some sleep during the journey. The flight arrives early morning the day after departure. . . . . are very busy – people flying home for Christmas (to and from other islands). The island is never crowded but the flights are very busy and fares are at a premium.